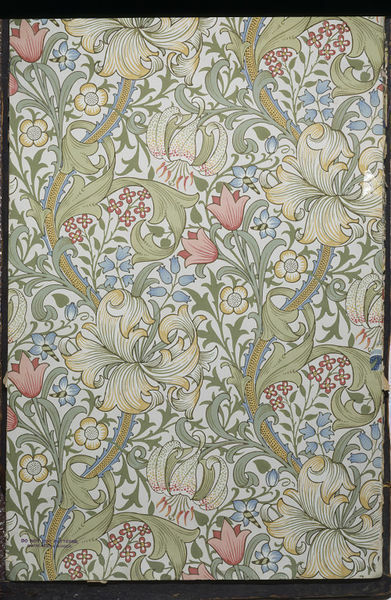 Specimen of 'Golden Lily' wallpaper, a variety of entwined plants, with pink, yellow and blue flowers and green foliage, on a pale ground; Colour woodblock, or machine, print on paper. 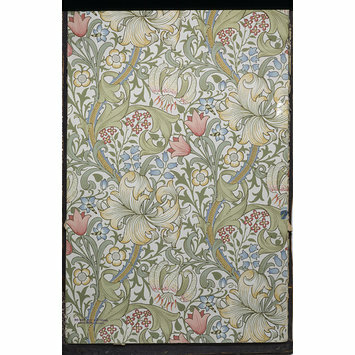 Part of a wallpaper pattern book containing 132 specimens (E.2734-2866-1980), mounted on a display stand, with a cloth cover. Printed on cover sheet of stand-book. Produced by Morris & Co., 449, Oxford Street, London. 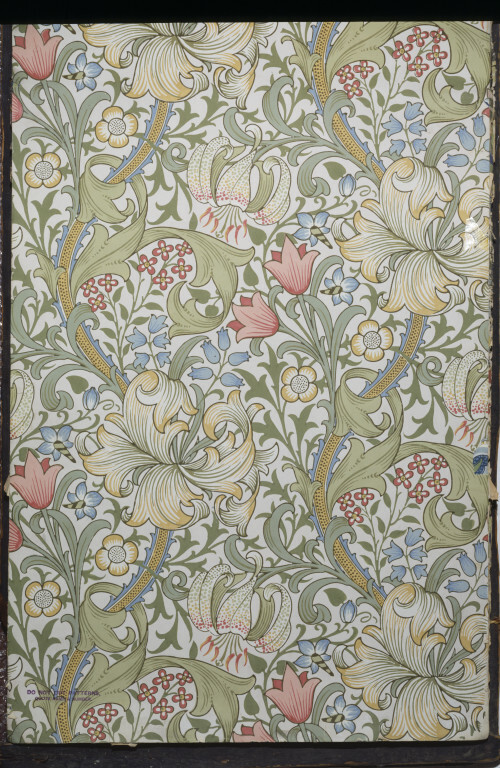 Specimen of 'Golden Lily' wallpaper, a variety of entwined plants, with pink, yellow and blue flowers and green foliage, on a pale ground; Colour woodblock, or machine, print on paper; Designed by John Henry Dearle; Published by Morris & Co.; Part of a wallpaper pattern book containing 132 specimens (E.2734-2866-1980), mounted on a display stand, with a cloth cover; England; 1880-1917. Saunders, Gill. Wallpaper in Interior Decoration. V&A Publications. London. 2002. pp. 118. pl 103. Part of a pattern book of wallpapers containing 132 specimens (E.2734-2866-1980) from 1880-1917.